Since beginning to run longer and longer distances, my idea of a training run has changed considerably. My sense of anticipation has also shifted quite a bit, to the point where anything less than 50 miles doesn’t really trigger any of my pre-race jitters or antsy feelings. That was certainly the case this time around as I approach the 3rd year of my birthday run tradition. I went to the Labor Pains 12-Hour race last year because it looked like a fun way to spend my birthday, and I knocked out 40 miles in the heat and humidity, and enjoyed every minute of it. The weather was considerably different this year, but the goal was the same. September typically marks the beginning of the fall racing season for me, and luckily the weather shifted to accommodate, with cooler temps and light rain/ overcast skies. This was less than ideal for the epicurean’s relaxation and reading plans, but it proved to be excellent running weather…mostly. We arrived about 30 minutes prior to the 7:30 start time, parked in almost the same location as last year, and I made my way to packet pickup. Other than the weather, the biggest difference this year was having company for part of the day. Michelle, a local friend, decided to make the drive up and use the race as her long run for the weekend, and it was great to have a familiar face to run with for a good chunk of the day. Our paces are very similar and we run a lot of miles together in general, so it worked out quite well. lap after Lap…ticking them off. 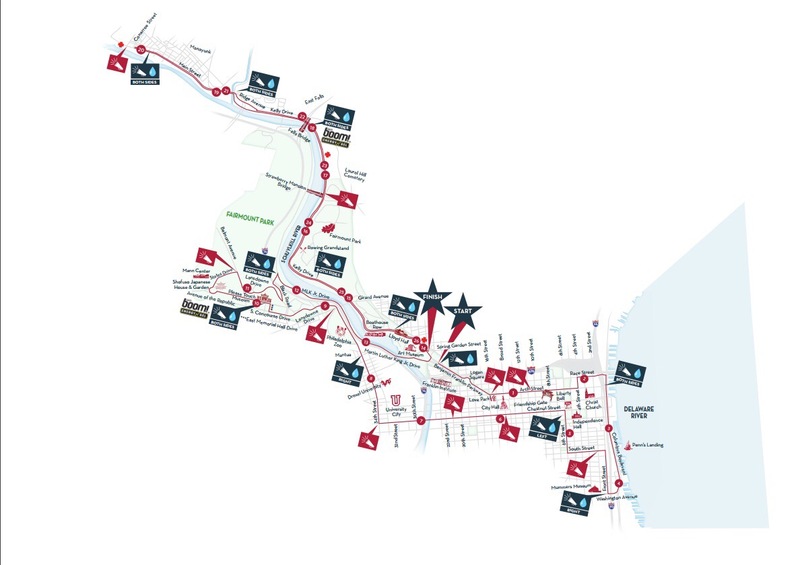 To refresh your memory, the course is a 5-mile loop with close to 1,000 feet of elevation gain. Runners complete as many loops as they want, stop when they want, and start again if they want. There is an aid station at the mid-way point, and the trail is mainly wooded single-track. All the rain this year added mud to the equation in copious amounts, and I did plenty of sliding around throughout the day. In general, my legs were feeling really good, and my pace remained relatively consistent throughout the day. Michelle and I ticked off the miles pretty smoothly, running the flats and downhill portions, and walking a few of the larger uphill sections after the first few laps. She ran the first 25 miles with me (plus the extra 1.2 for a marathon finish), and it made the time just fly by having someone else to run with consistently. After we said our goodbyes, i kept on moving and knocked out my final 3 loops with relative consistency. Such a great way to spend a birthday…chasing42! As usual, it was a very well-organized race, the aid station at the start/finish was nicely stocked with a variety of snacks, and I made sure to help myself to the beer at the half-way point during the last few laps as well! The weather may have been soggy and less than ideal for relaxing outside (sorry, beautiful epicurean!) weekend day, but it still proved to be an enjoyable day. I still have a few more years before I need to head back out for a 9th lap, and I will continue to return to this race as my birthday run tradition continues. I’ll keep #chasing42 for yet another year! I’m fully aware that this review is long overdue. As is usually the case, the summer seems to have gotten away from me amidst the various projects, work and home-related, taking up my time. With that being said, the Laurel Highlands 70.5-miler was an amazing race experience, and certainly worthy of a #chasing42 review! I try to be very respectful of the beautiful epicurean’s time and energy, and not drag her along to every single race I run. She has been overwhelmingly supportive from day 1, and I cherish that support. Since the Laurel Highlands 70-miler was a relatively local race, being just a 4 hour drive northwest into PA, I agreed to make the trip myself. The race took place on Saturday, June 10th and I took off Friday the 9th from work and made the drive up in the afternoon. The race is a point-to-point course, starting in Ohiopyle, PA, and running along the Laurel Highlands trail north to Seward, PA. As I was traveling alone, it didn’t make sense to bother with a hotel room for a few hours of sleep, so I decided to park my car at the finish and sleep in it Friday night. I got up to the campground around 4PM and got a quick lay of the land and made sure I knew where to park when I returned, and then I headed into Johnstown for packet pickup and the pre-race dinner and briefing. 2017 marked the 38th running of the race and they certainly have the logistics ironed out very smoothly. I showed up, collected my bib and shirt, and found a seat for dinner. The pasta dinner was quite good, and I was pleased and full as I left, having a much better sense of the course, and feeling content as I headed back to the campground/ finish area. I pulled out my packable camp chair and relaxed with a good book to enjoy the remaining sunlight before curling up in my sleeping back in the car to catch a few hours of sleep. The benefit of sleeping “outside” is going to bed when the sun goes down and not worrying as much about staying up late! I wouldn’t say I slept great, but I still got a decent amount of sleep before my 3AM alarm woke me from my slumber. Other folks had begun to arrive and park around me to secure their place at the finish area before the buses arrived to shuttle us down to the start. The buses cut through the darkness promptly at 3:30AM with their school bus charm, and we boarded silently in the dark. The drive ended up taking much longer and was much more winding and bumpy than I had anticipated so additional sleep was out of the question. We arrived at the starting area with very little time to spare, and everyone made a beeline for the bathrooms. I took care of business and walked up to the starting area with a few minutes to spare. The morning light was just breaking through in the park, and there was an air of calm anticipation running through the crowd as we waited for the signal to start. The falls in Ohiopyle made a great starting line! I opted for poles in addition to my normal Salomon pack, soft flasks, and various nutritional needs. The course itself has over 11,000 feet of vertical gain, and the jagged elevation profile left me confident that the use of poles would be a good choice. I was certainly correct! After a short jaunt on the road to the trailhead, we hopped on the Laurel Highlands Trail and didn’t leave it for the next 70 miles. The trail itself was consistently technical, beautiful single track with some spectacular views. I told myself I would actually stop at least once to take in the views this time, and I eventually did make good on that promise. The first aid station at mile 11.6 made for a bit of a longer first section, but fresh legs and plenty of Tailwind, along with the energy of the race and the people around me made the miles tick off pretty quickly. There was no shortage of climbing, however, and I had accumulated well over 2,000 ft. of vertical gain. The next section was filled with shorter but more frequent climbs, and I was starting to have flashbacks to the Georgia Death Race and the constant climbing and descending. I had heard that a majority of the climbing for this race was in the first 20 miles, so I was prepared for it, and my legs held up really well. All of the climbing I had been doing in training was certainly paying off. I didn’t spend long at the aid station at mile 19.6 and got back out on the course to keep my momentum going. I should have known better, but for a brief moment as I was leaving AS #2, I actually thought the course would get easier. It didn’t. The aid stations were further apart than in many other ultras, and I enjoyed the old school feel of the race. It forced me to pay more attention to my hydration and nutrition, and plan accordingly for the longer chunks of miles. Things started to heat up, literally, by mile 30, and the crowd of 143 runners (70.5 distance) had begun to thin out quite a bit so I was spending significantly more time by myself. The climbs kept coming, and the rocks and roots continued to make the trail a formidable companion. My head seemed to be bouncing between the trail and the views as I tried to simultaneously not trip and enjoy the gorgeous landscapes laid out before me along the trail. I should note that this is not a bad problem to have, and the constant distractions made the miles and climbing much easier as I continued my relentless forward progress. Eventually, I made it to the mile 46 aid station and eagerly anticipated access to my drop bag. This aid station experience was one of the best I’ve ever had thanks in large measure to an amazing volunteer that helped me from start to finish. I was pretty darn hot, had run out of water, and was soaking wet from sweat so a cold rag and ice water on my neck and back felt amazing. He grabbed my drop bag, refilled my bottles with Tailwind, and I put on a clean shirt and a fresh pair of socks. By the time I left the aid station, I felt like a new man. The drudgery of the previous 7 miles (after AS #4) was a distant memory, and I headed back out on the trail with renewed vigor and excitement! I made it to the next aid station at mile 57 with ease relative to the previous miles, and was in really good spirits. At this point, I was determined to see how far I could get without using my headlamp. I rolled in, fueled up, and pulled out my headlamp in anticipation of using it soon, but I still had some light in the sky. I danced with the setting sun almost as far as the next and final aid station at mile 62, helped in part by a short stretch of dirt road up to the AS that I could navigate with very little light. I was all smiles as I pulled into the final aid station, took a few shots of Coke, and struck out for the final stretch. It got dark pretty quick, but my headlamp cast a nice wide beam so I had no trouble navigating. After about a mile, I found myself running nearby to another runner, which hadn’t happened in quite a while. We got to talking and humorously discovered that we followed each other on Strava, and lived miles from each other but had never met in person. We ended up running in the final 7 miles together and talking the entire time about a whole host of topics, which made the time fly by rather quickly. We both had been thinking about the possibility of breaking 18 hours as the finish line grew near, and we began to push as hard as we could with 5 miles or so to go. We kept looking down at the clock and knew it would be close, especially since we weren’t entirely sure how much we had left as the finish grew near. We made the final push and “sprinted” across the finish line in 18:03. All finishers received a beautiful wooden “trophy”, which was a small replica of the permanent stone obelisk trail mile markers along the Laurel Highlands Trail, and I was quite happy to claim mine. I hung around the finish area for a bit, sipping on soup, and cheering on other runners before eventually making my way back to the car around 12:30AM. I was exhausted, and my wet wipe “bath” didn’t really cut it, but I was too tired to care and I climbed into my sleeping bag for a few hours of restless sleep as my sore leg muscles began to repair themselves. I predictably woke up with the rising sun, briefly enjoyed the cool morning air, and then hopped in the car for the 4 hour drive home. It was a whirlwind weekend, as so many race weekends are, but I absolutely loved the course, the volunteers, and the overall experience. I collected my second Western States qualifying race as well, and fully embraced the #chasing42 spirit along the way! We packed up the car on Thursday after work, dropped Baxter off at daycare, and piled into the car with Looper. I knew we’d hit some rush hour traffic heading south on 95, but we wanted to tackle a portion of the drive that night so that our trip down to Raleigh the next day would be relaxed. We made our way down to Fredericksburg, VA and settled into a hotel for the night. It was pouring rain when we woke up the next morning, and I couldn’t help but have flashbacks to my water-logged trek at Grindstone. However, I stayed positive and we headed down the interstate and made our way to Raleigh, NC and to Umstead State Park. We arrived around 1pm, checked in, and found our way to the cabin I had reserved. It’s rustic charm was bolstered by the fact that it was literally steps from the race course. Having the indoor space to spread out everything and get settled made the evening that much more relaxing. We found a late lunch in town that afternoon, and then made our way back for the pre-race meeting. Afterwards, we made our way back to the cabin and sat out on the porch, watched the sun set, and then settled in for an early bedtime. I was quite pleased to be able to get a full night of sleep before the race! The alarm went off at 4:30AM the next morning, and I quietly got out of bed so as not to wake the beautiful epicurean. I began to get my pack squared away via the light of the headlamp, ate a small breakfast. We made our way up to the starting area around 5:45AM and the the camp was buzzing with pre-dawn excitement! My training block leading up to this race had been the strongest I had ever had, and I was filled with the excitement of possibility. After a brief moment, the RD sent us on our way into the darkness for the first of eight 12.5 mile loops. The shorter distance meant I’d be returning to see the epicurean regularly and she could relaxing at the cabin with Looper in the interim. Going out too fast has always been my achilles heel, but I was committed to being patient and getting a sense of the course. I rode the slight rolling hills and let my breathing guide my pace as I ticked off the early miles. I was able to switch off my headlamp after 30 minutes or so, and watching the sun rise over the wooded landscape was a breath of fresh air. The entire course is made up of relatively wide biking and running dirt paths and my fears of the previous days rain creating a muddy mess were quickly alleviated. the first decent climb popped up around mile 4, and I was happy to power hike up it, and was greeting to a small lake near the top of the rise. There were several unmanned aid stations sprinkled throughout the course, which meant I only had to carry my hydration vest with one 500mL soft-flask. It was refreshing to not be weighed down by a full bladder and I knew I’d appreciate it even more later on. The mid-loop aid station emerged at around mile 6.85, and the full spread of food and drink that greeted me was a beautiful sight, as were the wonderfully helpful volunteers. After my first visit, I left with added confidence and a smile on my face. Several smaller but steeper climbs followed along the rolling path, and I forced myself to walk them and saved my energy for the downhills and flats. This strategy served me well and I was making the final climb up Cemetery Hill before I knew it. I made the turn down into the camp, and the epicurean’s smiling face greeted me. She quickly refilled my water bottle with Tailwind, tossed me another pack of honey stinger chews, and collected my headlamp. Efficiency was the name of the game, and she was on her game! I rolled up to the start/finish area and logged my first loop in 2:06, which felt well within my ability for the 12.5 mile loop (1000 feet elevation gain). The second loop was more of the same as the cool forest air whispered through the trees. I was focusing on keeping a calm and relaxed demeanor and really enjoying my time out on the trail. I had been training for this race for the last 3+ months, and this was the reward. This loop sent us back out of camp the way we came, and down and out-and-back flat spur for the first 3 miles or so. This would be the route we would take for the rest of the race so I had plenty of time to bond with the nuances of the trail. Ironically, I would come to resent this flat section and wish for the rolling landscape that would follow. Who am I, and what did I do with the flatlander?! The remainder of the loop flew by without incident, and I felt like I was out for any other Saturday morning run. I rolled into the start/finish at 4:12 elapsed and feeling great with 1/4 of the race in the bag. I stopped to visit the epicurean and she topped off my water while another nice spectator randomly offered to help me apply some sunscreen. It was a reminder of just how much of a family the ultra community truly is, and I rolled out for my third loop with high spirits! The relatively groomed trails on the course meant full-blown trail shoes were overkill of a sort. So, I went with a lightweight, comfortable pair of Hoka Clifton 2s. Once I added my trusty dirty girl gaiters, my feet were quite happy. Luckily, this happiness persisted for the entirety of the race, and my feet were blister-free by the end. What a pleasant surprise! The temps did begin to rise a bit towards the end of the 3rd loop, and during the 4th loop, and the sun added some heat in the low 70s, but it was far from uncomfortable. I was focusing quite a bit on hydrating and made the decision early on to drink at every aid station, as well as cool my wrists and head if need be. This proved to be an excellent strategy, and the ice cold water at each of the aid stations was a treat I looked forward to every time. The volunteers were clearly refilling the coolers with ice pretty frequently, and I was thankful for their dedication. Aside from the heat, everything was firing on all cylinders, and the next two loops flew by rather smoothly. I arrived at the half-way point in 9:01, and my legs were still feeling really good. I was alert, had plenty of energy, and wasn’t feeling overly hungry or thirsty. In other words, I was in a best-case scenario at the half-way point, and was doing my best not to get too excited or get my hopes up. I still had 50 more miles to go, and a lot could happen in that time! By this point, I had mapped out the route pretty well in my head, and knew the distances between key points on the course, including the aid stations. This made it really easy to set small goals between these points and focus on my running during those intervals. The sun was on it’s downward path by the 5th loop, and the temperatures slowly began to cool. I had definitely settled into a rhythm at this point, and I knew when to walk and when to power hike without really even thinking about it. This would normally be the point where my quads begin to get a bit tight, but my legs were still feeling relaxed, and my feet were quite pleased with my shoe choice. Although my nutrition was still working, I was definitely reaching a saturation point with the honey stinger chews. Ironically, I had moved to using them when I dialed back my sugar intake and GUs and Cliff Shot Blocks began to taste too sweet to me. Now the Honey Stinger chews were beginning to taste too sweet to me as well. Luckily, I had plenty of solid food options at the aid stations, and began to eat more fruit, salted potatoes, and cookies. This, combined with my trusty Ginger Ale, made for a strong nutritional combo. My pace was slowing somewhat, but I was still moving really well and feeling confident. I completed the 6th loop around 8:15PM, just as the sun was setting. The epicurean was in high spirits as she checked in to see what I needed. I claimed my headlamp, along with more Tailwind, and some ginger chews, and set out once more. I was only a hair over 14 hours in, but only had 25 miles left to go. My energy was high, and it became a bit harder not to get overly excited. After a mile or so, I flipped on my headlamp and set out into the darkness. This was a far cry from the exhaustion as I set out on the second night at Grindstone, and I was at a loss. At this point, the 250+ runners were spread out pretty well along the 12.5 mile loop, and I found myself mainly running alone. However, I had a very pleasant conversation with a badass blind runner and his guide as they expertly navigated the terrain. We shared some great stories over the course of a few miles, and we arrived at the mid-point aid station together. After a quick refueling, I bid them good luck, and headed back out as they took a moment to rest. This would normally be the point at which the smaller climbs begin to seem more daunting, but I was still climbing swiftly and bombing down the descents at a pace I probably had no business going. I had spent the last few months focusing on training on the downhills and strengthening my quads, and it was quite gratifying to know that the work had paid off. I made my way into the start/finish at 17:20 at the end of the 7th lap, and I let the excitement of the final loop begin to well up inside me. My legs were definitely tired as I made the climb out of camp for the final time. I resented the flat out-and-back more than I should have, but gave myself permission to walk a few segments, encouraged by the fact that I wouldn’t be returning. I was counting down the miles more now than ever, and allowing myself to enjoy this final victory lap of sorts. I crossed the small bridge at mile 4 to begin the climb, and quickly realized that my headlamp was the only breach in the dark in all directions. I never once felt tired, but I began to hear sounds in the woods, and I sent my headlamp into the darkness where it was met with numerous pairs of glowing orange eyes. I was power-hiking up the long climb and trying not to get too freaked out by whatever was clearly tracking my movements. I didn’t have the energy to move any faster, and I “may” have let out a few screams into the darkness to try and scare away whatever had taken an interest in my movements. I eventually moved past this section, but the irrational fear stayed with me for much longer. I rolled into the mid-point aid station for the final time and treated myself to some delicious broth, which was equal parts warming and hydrating. Luckily, I was moving quickly enough that I never got cold, and remained comfortable in my short sleeve shirt the entire time. I set out on the final 5+ miles and was energized as I crested the top of each hill and ran down each descent, my quads still feeling strong. I rounded the corner into the final straight-away, stopped briefly at the last aid station, and then pushed on. Plenty of folks were passing me in the opposite direction, heading out for their next loops, and it was nice to see more people again. I reached the camp, and began to slowly run down towards the finish as hearty volunteers cheered me on in the dead of night. The camp was lit up, and the cheers energized me as I made the last small climb and crossed the finish line. I was all smiles and quickly spotted the epicurean, who reminded me to turn off my headlamp 🙂 The RD came out and handed me my buckle and I was a bit in shock. I crossed the finish line in 20:26, which was well beyond what I had hoped for, and a PR by more than 2 hours! I happily took the opportunity to make my way inside hear a warm fire and it felt glorious to sit down for the first time. The french toast was delicious, and the hot coffee was long overdue. After resting for a bit, the epicurean and I slowly made our way back to the cabin. i gave myself a quick wet-wipe bath, and then curled up in my sleeping bag. It was 3AM, obviously late, but I was lying down to sleep. I had no expectations of being able to do so, and it was an opportunity my tired legs relished! I was sore the next morning as we loaded the car, and made the 8 hour drive (damn traffic!) back, but “20:26” kept popping into my head and I couldn’t stop smiling. You never know exactly how a race is going to play out, and I’ve come to expect the unexpected, which made this smooth, comfortable, and challenging race that much more special. This was truly what #chasing42 is all about, and I have the buckle to prove it! When a friend messages you to let you know he found a bib for an upcoming race for you, you don’t ask too many questions. This is even more true if it’s a race you wanted to run in the first place. I suppose distance does play a part in such decisions, but I happily added a last-minute 50K to my early season race calendar. The PHUNT 50K/25K is a race I had been hearing about since I moved to Delaware 18 months ago, and I was eager for the chance to toe the line! The Trail Dawgs Running group is a fantastic local group of trail and ultra runners who put on a number of great races in the area, including a marathon I did this past May. In general, the running community in Delaware/Maryland/Pennsylvania is fantastic, and the Dawgs are a big reason for that! So, I knew this would be an enjoyable, laid back, and well-run race with a bunch of cool folks. Of course I wanted to spend a few hours out on the trail! The unusually late 9AM start time, coupled with the easy 25 minute drive, meant I was able to sleep in on a Saturday morning, which felt rather strange! I had time to relax, have some breakfast, get read, and still arrive in plenty of time to wait in the short porta-potty line. I’d certainly call that a win! One of the reasons I love small trail races so much is for the ease and convenience, and this race definitely worked that aspect quite well. The large activity hall at the Fair Hill Recreation Area, right next to the start, provided more than enough warm shelter for runners prior to the race, and proved a great location to meet up with friends before the race. Did I mention the convenience? Around 8:55AM, we wandered outside and made our way towards the starting area, and at 9AM sharp, the RD unceremoniously sounded a starting horn and we were off. No corals, no timing mats, no waiting around for waves. It was all about going out on some beautiful single-track trails and having a great time. The course was two 15.6 mile loops, with aid stations at mile 3.8, mile 7, and mile 10.8. I didn’t need my hydration vest by any means, but wore it anyway so I could easily carry my phone, nutrition, and the all-important TP. The forecast had called for rain and snow earlier in the week, but it pretty much all held off, with the exception of some light sleet, so the trails were for the most part in great shape. I had no intention of racing this event hard, but of course the adrenaline of the first race of the year got the best of me, and I went out and ran the first mile in about 8 minutes. I knew the course didn’t have any significant climbs, but I wasn’t sure about total gain. However, I knew I had gone out too fast, but my mile 1.5, I figured I’d push it a bit and see what happened. The 50K and 25K runners started at the same time, but the pack still spread out pretty quickly. I was moving really well on the comfortable terrain, and found myself latching on to several different runners for pacing over the course of the first loop. I spent minimal time in well-stocked and energetic aid stations and saw it as an opportunity to practice efficient transitions for future races. The temperature was hovering right around 30 degrees, and I quickly regretted the running tights. I know I run hot when I’m racing, so I should have known better. I was moving really well, and eagerly tackling the short climbs on the rolling terrain. I had committed to running this first loop at all points, and I enjoyed the challenge those first 15+ miles presented. The first loop flew by rather quickly and I rolled back into the start area after about 2.5 hours. I realized around mile 12 that the other runners I was latching on to were probably only running 1 loop (25K) but I rolled with it and kept pushing. My legs were a bit tired at the end of the first loop, but I had been hydrating well and taking in a decent number of calories, so I was feeling good. I spent a few minutes at the aid station enjoying some Coke and GU waffles, and then launched myself back out onto the course. The crowd on the second loop was obviously a lot more spread out, and I almost felt like I had the trails to myself at times, which was fantastic. The trails were still in really good shape, even after 500+ runners had trampled them on the first loop, and my feet were feeling really good thanks to my Altra Olympus 2.0s. I kept expecting to hit some sort of wall on the second loop, but thankfully never really felt any sort of bonk, despite pushing it a bit hard on the first loop. My pace did slow somewhat, and I walked up a few of the hills, and lingered at the aid stations a bit more, but still felt really good for the most part. It began to sleet a bit at this point, but the tree cover provided plenty of protection, and it created a nice natural forest chorus as it struck the foliage around me. I was able to set small targets for myself during the second loop, which was helpful as well. That’s definitely the advantage of a looped course, and one of the reasons I enjoy them so much…as long as it’s an enjoyable loop! I rolled into the finish line calmly in around 5 hrs 29 min (16th place, 6th in my always tough age group!) and would have happily gone out for a 3rd loop after such an enjoyable race! My quads were a bit sore, but nothing out of the ordinary, and I was overall really pleased to have such an early 50K under my belt. I collected my medal and unique finisher’s plate, and relaxed for a bit as I waited for others to finish. The environment, support, love of running, quality trails, excellent organization and aid stations, and energy that this race had is what trail running is all about. I can think of no better way to begin #chasing42 in 2017! Well, it feels like an eternity ago, and I could pontificate on the variety of reasons why I haven’t written this review sooner. It’s the holiday season. The semester was coming to an end. Darker days sap my energy. Blah. Blah. Blah. At any rate, the reasons are irrelevant. The race may have taken place over a month ago, but the memories are still there so I wanted to share! Most folks are probably on the verge of being thoroughly entrenched in their holiday plans, balancing increased opportunities to eat with decreased opportunities to run, and not even thinking about races in 2017 just yet. December is always an interesting time for runners, especially those in cooler climates. The weekend before Thanksgiving is always a wild card when it comes to weather, and is typically about as late as you can push most longer races unless you are committing to the cold, or happen to live in Florida. I was actually a bit surprised that the Philadelphia Marathon was as late in the season as it was, but it provided me with a nice racing bookend for my season. I probably wouldn’t have even considered it, but for the fact that a good friend from Iowa decided to fly out for the race and end her season on a high note as well. I couldn’t say no to that! The epicurean and I made our way up to Philly on Saturday to pick up our packets in the afternoon before meeting our friend for dinner. It’s been a while since I’ve been to a larger race expo, and I found it interesting that the mystique of the experience definitely isn’t there for me anymore. If there was any question about whether or not I was a trail runner at heart, it was put to rest at the expo. I love the simplicity of a trail race, the community, and the environment. The expo just seemed overly commercial by comparison. Luckily, it was very well organized and we were in and out pretty easily. After a nice dinner, we parted ways and headed home for the night. In retrospect, it would have made much more sense for me to stay in Philly with my friend that night and not have to drive back up in the morning, but that didn’t occur to me for some reason. Hindsight is 20/20, eh? On the drive home, the temperature drops rather significantly, and the freezing rain began. Yikes! I could only hope that the weather system would be gone by morning, or the race would be brutal. 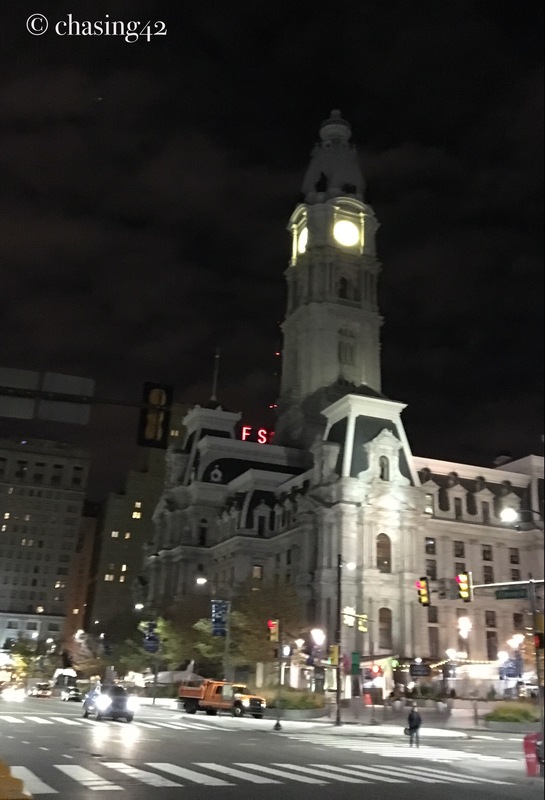 City Hall was all lit up early…the race began with the sun! I woke up on Sunday morning at a rather ungodly hour, and went through my pre-race routine in a bit of a haze before hopping in the car. I parked near the finish area, and walked to meet her at her hotel before the race. We procrastinated a bit to limit the amount of time we’d be standing around before the race, and then headed over. I was thankful I had worn a sweatshirt and a pair of flannel pants I could toss before the race, because the temps in the low 30’s and the 30-40 mile wind gusts made for a chilly morning. Those winds wouldn’t let up in the least bit over the course of the race, and they proved to be a challenge for many folks! I had no intention of truly racing, but rather wanted to go out and enjoy myself, and cheer on folks throughout the race. Thus, I decided to commit to dialing things back for the first half of the race, and then seeing if I could conjure up a negative split. I went out rather conservatively, and stayed closed to the 4 hour pace group. The cold wind, and my lack of warm clothing probably pushed my pace a bit more than I had planned, but I still managed to run well within myself. The crowd support throughout the race was phenomenal and the route through the city was visually entertaining. Over the years, I’ve had a love/hate relationship with Philadelphia. I’ve always seen it as being a bit too dirty, and lacking the character and charisma of someplace like New York or Boston. However, as I’ve spent more time in Philly, I’ve grown to appreciate it for what it is and stopped hoping it would be something different. The history is obviously important, but the character of the people and the energy they bring to the city is equally important. Philly is a city of hard-working folks who go about their business, don’t try to be too flashy or outgoing, but still establish themselves as worth of their position as a World Heritage site, among other accolades. I was reminded of this subtle significance as I calmly tackled the first half of the course. I meandered through the course, sticking to my slower pace and trying to stay conversational, even if I wasn’t actually conversing with anyone along the way. It’s a relatively flat course as far as I’m concerned, but trail and ultra-running has arguably skewed my perspective a bit. Over the course of various other runs, I had become familiar with a majority of the course as well, which helped me feel quite comfortable throughout. The few hils of consequence that do exist along the course are conveniently located in the first half, around miles 6 and 8, which made slowing down a bit that much easier. The route passes the Philadelphia Zoo around mile 8.5, but sadly the animals weren’t lining the streets with the crowd to cheer us on. I would have appreciated a clapping monkey at the very least! Around mile 10, after a bit of climbing, the route passes the “Please Touch Museum”, and I had to giggle as I heard a few folks wondering if this was the art museum, and hence the end of the race (for the half, I presume). They sounded a bit sad upon realizing they still had a few more miles to go, but it was a mostly downhill route to the finish of the half marathon so I’m sure they survived. I hit the half-way timing mat in 1:55, which was a few minutes ahead of my modest 2 hour target, but still very comfortable. After a few hours of calm running, I was excited to pick up the pace a bit and really stretch my legs. Around mile 14, you pass near the finish line as you head out along the Schuyukill River for an out-and-back segment. Years ago, I probably would have been annoyed at being so close to the finish line, but I was simply excited to pick up the pace along the river. I’ve run along this stretch of the river on a number of locations, and the route has a particular urban beauty to it as you progress along the shore. If it had been earlier in the fall, you would have seen crew teams out practicing on the river. As it was November, we had to settle for the wicked 40 mph winds indecisively alternating between blowing us along and bringing us to a standstill. Over the course of the next 4 miles or so, I pushed myself a bit and enjoyed realizing how much pep I had in my legs after 13 miles. In some past races, it has taken me a solid half marathon to even warm up and hit my stride, so I was definitely aware of the endurance training at work. I received a small ping of happiness each time I passed someone, and it helped me forget just how cold I was with very little to break the wind or protect myself from it. The route continues down the river until around mile 20, where you reach the turn around point and naively hope that reversing directions will help with the wind. It did not. However, it was fun to see so many runners with the out-and-back segment and be able to cheer people on. After mile 18 or so, I pulled up a little, having passed the 3:45 pace group faster than I anticipated. I was comfortably in negative split range, and sought to maintain a decent pace the rest of the way that would challenge me but not exhaust me. I may prefer smaller trail races, especially due to the family atmosphere, but there is still something special about a large urban marathon. I’m always keenly aware of the folks out there pushing themselves, running the distance for the first time, or attempting a new PR or a BQ. The extrovert in my loves cheering people on, and feeling as though I am sharing their their triumphs and struggles. It was that energy that propelled me back along the river towards the finish line as the final 10K ticked off. The crowds weren’t heavy along this stretch, but they were consistent and you never felt alone. I made a point of stopping briefly at each of the well-staffed and well-stocked aid stations and thanking the volunteers, and surprisingly managed to keep myself properly hydrated the entire time. The race finishes near the famous Art Museum steps immortalized in the Rocky movies, and the spirit of the marathon is certainly characterized by that particular brand of grit and hard work. I crossed the finish line in about 3:39 as the Garmin flies, and locked in a solid negative split in the process. I have never run a negative split during a marathon so it was a nice feather in my running cap. I finished just a few minutes behind my Iowa friend, which made it easy to find her amidst the crowd. We collected our medals and space blankets, and shuffled our way through the finish chute towards some snacks and water. Had it been a warmer day, I would have loved to stick around and cheer others on. However, we began shivering pretty quickly so our priority became heading back to the hotel for a hot shower and some more substantial food. As I walked back, I was subtly aware of how good my legs felt, which brought a smile to my face. This marathon was all about the human element, and the celebration of our sport, and I couldn’t have been happier with the smiles I logged along the way while #chasing42! 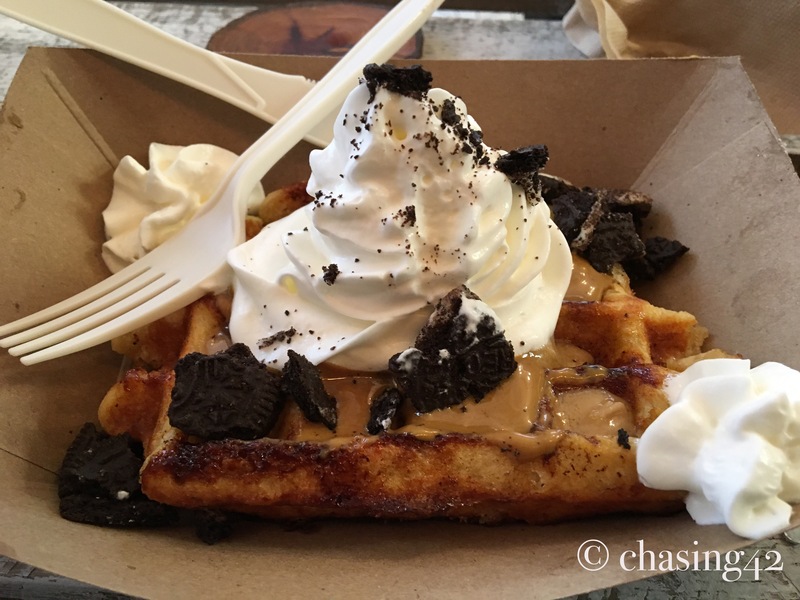 Delicious waffles make a great post-marathon treat! Did you think I forgot about you? Decided to just leave you hanging? It’s more likely that last week was simply a perfect storm of projects at work. However, it’s fitting that you are now curling up to read this the day after Halloween, to keep the fear factor going. Ok, so it’s not THAT bad, but it was certainly an adventure! N. River Gap (AS #5) to Little Bald Knob (AS #6): I knew this climb would be daunting to some degree, but I had apparently missed the “Grindstone Grind” nickname when I was reading old race reports. It was well after midnight by the time I set out on this climb, which meant it had been raining for almost 24 hours already. I gathered pretty quickly that this was a challenging climb under the best conditions and a downright slog under the conditions I was now facing. I took some solace in the fact that everyone was in the same boat, but this didn’t do much for my morale once I was out of earshot of the aid station and plunged into the darkness. It’s relatively common to hit a low spot or two during races of this distance, and I’ve certainly had my fair share of “screw this” moments. Typically, though, they come a bit later in the race. This time, my legs were still feeling fresh, and the rest of my body was coping with the distance and the time on my feet just fine, but the mind was challenging me. At one point during this climb, as I was slowly pushing my way up the mountain, I exclaimed out loud “it’s 3AM, pitch black, the only thing I can see is illuminated by my headlamp, I’m soaking wet, stomping through more mud than I’ve ever seen, climbing up a mountain, and I’m all alone…why am I doing this?” I kept moving forward, my trekking poles slowly becoming my saving grace, and eventually could only laugh at the ridiculousness of my situation. I eventually made my way to the top of the climb, but that simply meant that the flat land became a marsh. I plodded along through ankle-deep water and mud, getting colder and colder as my speed decreased. I had avoided pulling out my rain shell thus far since the rain had been light enough that I was wet but not cold. However, once my pace slowed down on the climb, I started to get quite chilled. I eventually stopped and struggled to pull out my shell and put it on over my pack because I didn’t have the dexterity in my fingers to take everything off and re-situate it. Luckily, someone stopped and helped me get my shell on, for which I was eternally grateful. This last section of the segment seemed to take forever, but I could not have been more happy to see the next aid station. I rolled in, having warmed up a bit, and filled myself with mashed potatoes, cookies, and some broth, all of which tasted delicious. I spent a few precious minutes warming myself by the fire, but knew I needed to be on my way. I had come close to entertaining the thought of dropping during that climb, but arriving at the aid station, and knowing that I would be reaching the half-way point soon was enough to restore my confidence. I thanked the volunteers for their time, and headed out again into the darkness. Little Bald Knob (AS #6) to (halfway point): The first section of this stretch can best be described as a series of muddy, rut-filled paths that had been dug up by trucks and other vehicles traveling up and down them over plenty of time. Deep ruts and rain make for some mighty impressive puddles and small bodies of water. I’m not entirely sure why I continued to try avoiding the large puddles since my feet were completely soaked (along with the rest of me) at this point, but I think it may have at least helped to keep me alert and moving forward. There were no significant climbs, but rather a series of rolling hills that seemed to go on forever. This was the only small window of time where sleep deprivation caught up to me a bit, and I did some sleep-walking, but it only lasted for about 45 minutes, which I considered a victory! The rut-filled path gave way to a paved section of road that wound up to the top. I had been especially looking forward to reaching this summit, as the views at the top looked spectacular. However, it was still raining and overcast, so my wishes were not going to be granted on this particular day. I fell in step with another runner, and the two of us made the push up to the top, recognized that the hole punch we were supposed to find had long since been stolen, and we headed back down the mountain on the two-mile or so journey into the half-way point and the next aid station. This short paved section reminded me of just how long I had been on my feet already, and I was eager to return to the soft, marshy, muddy trails. Such hilarious irony! I rolled into the aid station and was greeted by the epicurean and others. To say that seeing her lifted my spirits after a night by myself would be a huge understatement! I eagerly traded my wet short-sleeve shirt for a dry long-sleeve shirt, replaced my rain shell, and even gingerly slipped on a dry pair of socks, even if they only stayed dry for a short time. The epicurean’s bag of delights also included a dry pair of waterproof mittens and the opportunity to hand off my headlamp for charging. She had already been standing out in the rain at the aid station for quite a while, mostly to make sure she didn’t miss me, and seeing her was the boost of energy that I needed to set out on the journey back the way I came with the confidence that I could finish this race. That faith would be tested at one other point, but I left the halfway point in good spirits and back-tracked my way down the mountain. Halfway to Little Bald Knob (AS #8): This section was relatively uneventful. I welcomed the daylight, even if the sun didn’t make much of an appearance, and the light, combined with warm clothes and plenty of fuel, gave me a nice boost of energy moving forward. I knew what to expect at this point as well, which filled me with that much more confidence. However, this wouldn’t be a true trail race without a few wildlife adventures. On the way back down the rut-filled trail, I came across two pickup trucks with hounds riding in the back in large boxes of a sort. As it turned out, this was the opening weekend of bear-hunting season in the area! Luckily, I didn’t meet any new friends, but I did manage to narrowly avoid stepping on a rattlesnake on the side of the trail. This close encounter certainly refocused my attention on the trail, and I spent a fair bit more time near the center of the trail. 🙂 I arrived back at the Little Bald Knob aid station for the second time, and in much better spirits. My nutrition plan had been working really well at this point, and I didn’t want to mess with what was working, so it was coke/ginger ale/ pretzels/ cookies/ potatoes once again. I left in good spirits, despite knowing that I now had to make my way back down the 7-mile Grindstone Grind! Is that me, or bigfoot? You be the judge! Little Bald Knob to N. River Gap (AS #9): Everything looks different in the daylight. In this case, that meant being able to clearly see the swamp I had already waded through, and now had to slog back across, just to get to the muddy mountain. Any small portion of dryness on my feet was squashed out as I made my way across. Once I hit the trail heading down back to N. River Gap, I can best describe the experience as mud surfing! The trail was even more of a mess than on the way up, and my trekking poles came in mighty handy as I slowly picked my way down the mountain. I managed to fall only once, which I considered a fair accomplishment. After a mile or two, I fell into step with two other runners, and we made our way down the mountain together, which definitely helped with my energy and momentum. I no doubt moved much faster than I would have on my own, and pushed myself to hit the slope aggressively. By the time I rolled into N. River Gap, I felt like I was covered in mud, but it also meant hitting the 100K mark (or close to it), which gave me another mental boost! I met the epicurean, indulged in a delicious Going the Distance Muffin, and discovered a stockpile of Reese’s Peanut Butter Cups to supplement my potatoes. I “may” have gone a bit overboard with the Reese’s, and that came back to bite me in the stomach a few miles later. N. River Gap (#9) t0 Dowells Draft (AS #11): I had to do a bit of walking to get my stomach back in order but it was nothing I couldn’t handle. This section, from miles 65 to 80, involved some more decent climbing and descending, and it was a bit of a blur amidst the mid-afternoon light. I wasn’t sleep-walking by any means, but I was approaching 36 waking hours in total, so I focused my energy on putting one foot in front of the other, utilizing my trekking poles, and continuing to make relentless forward progress. I met up with a few different runners along the way, and that definitely helped to pass the time and miles. I knew that once I reached Dowells Draft, I’d see the epicurean, and then again at all of the remaining aid stations. This helped push me forward because I knew once I got to mile 80, I could happily mark my progress in smaller segments. Dowells Draft to Dry Branch Gap (AS #12): Aside from the Grindstone Grind, this was hands-down the most challenging section for me. After fueling up, and leaving the epicurean in good spirits, I wandered off into the woods amidst the dusk light breaking through the tree canopy. It had finally stopped raining for a bit, and the light streaming down to the forest floor was simply beautiful. After 36 hours of fog, rain, and poor visibility, the beauty of this area was overwhelming to the senses. After about a mile of meandering along the relatively flat portion of the section, I began climbing. The sun made its departure, and I flipped on my headlamp for another night of darkness. I had been running for a bit over 25 hours at this point, and the darkness brought the first real signs of fatigue. I had been excited about the fact that the race began in the evening initially, because it meant I’d be running through the night on fresh legs. I wasn’t counting on running into a second night and my body began to revolt. Unfortunately, this drowsiness set in just as the incline increased, and I felt like I was climbing hand-over-foot. Under foot were slippery, wet, shifting rocks, and to the right of me was a sheer cliff face that would have caused vertigo if I had been able to see more than 5 feet in front of me. I slowly worked my way up the mountain, bracing myself with my trekking poles because my footing was far from sure, and I tried to concentrate on staying on the trail and not worrying about falling off the mountain! The climb seemed to last forever, and my foggy brain could not, for the life of me, remember running down this steep mountain face on the way out. I obviously had, but it had not given me nearly as much cause for concern. After quite some time, and many false summits, I found myself at the top, and was greeted by a flatter but just as rocky section of trail. I had, in part, motivated myself to keep climbing because I thought the aid station was at the top, so I was rather dismayed to find nothing but more rocks and darkness at the top. After another good chunk of time, I finally arrived at the Dry Branch Gap aid station, and I could not have been more happy to see people, and see the epicurean especially! At this point, I briefly sat down in a chair for the first time, and getting up was one of the hardest things I had done. I rehydrated, and ate as much as I could handle before departing, and took solace in knowing there was only one more aid station before the finish! Dry Branch Gap to Falls Hollow (AS #12): This section started out like most, with a significant climb that just kept going. At this point, the racers were quite spread out, so I was very much alone on the trail, and left to keep myself company as I moved higher and higher up the steep incline. After a mile or two, I reached the summit of sorts, and visibility was almost non-existent. My headlamp simply highlighted the fog, and it was all I could do to make sure I was stepping onto solid ground as I moved forward. At this point, I began to have what I can only describe as the most intense feeling of deja vu I had ever experienced. I was absolutely sure I had been on that mountain before, and taken that exact path. To my knowledge, I hadn’t, so I know my mind was playing tricks on me, but it was an uncanny feeling. I was also quite exhausted but kept moving forward, even though I felt like I was going in circles and not actually on the course any more. In my sleep-deprived state, I was fully prepared to huddle up in a ball on top of the mountain and wait for morning because I felt like I was hopelessly lost. Just as I had begun to have these thoughts, I spotted another headlamp up ahead and I picked up what little pace I had left to try and catch it, assuming it was real. Luckily, it was real, and it belonged to a fellow runner. He and I commiserated about the climb, visibility, and the race as a whole, and worked together to get back down the mountain to the final aid station. There was no shortage of stream crossings, mud pits, and rocks intentionally placed to kill us, but we worked together and the time went by much easier. Together, we made our way to the Falls Hollow aid station, and I got my 4th or 5th wind just as we rolled in. I briefly greeted the epicurean, downed some ginger ale, and then the two of us were off into the night once more. Falls Hollow to the finish: The last 5 miles or so were some of the best miles of the entire race. The trail was relatively runable, the company was wonderful, and the great conversation helped the miles melt away. At this point, I knew I was going to finish, and it was a fantastic feeling. I may have been beyond exhausted, but I’m pretty sure I had a smile on my face the entire time. As we neared the last turn back into the Boy Scout Camp, we met a few other runners, and we all decided to trek in together to cross the finish line. After more than 32 hours, I crossed the finish line a bit after 2AM, and I was almost too tired to really be emotional. Clark, the RD, handed me my buckle and finisher’s shirt and congratulated me, and the group of us all shook hands and congratulated each other. As is the Grindstone custom, we hugged the pole near the finish, and that was that. The epicurean and I made our way back to the car and campsite, and promptly decided we had no interest in sleeping outside at this point, and agreed to find a hotel room. Sadly, after packing everything up, we discovered that every hotel in the area was completely sold out because it was the opening weekend for bear-hunting season. Yes, you read that correctly. Bear-hunting season. Good grief! So, we stopped at a gas station, the epicurean poured herself a big cup of coffee, and we hit the road for home. I definitely passed out for a portion of it, and spent the rest of the time failing to get comfortable and admiring the enormous blood blisters on both of my big toes. We got home around 9AM, I hopped in the best shower I’d ever taken, and then we collapsed into the bed until that afternoon. I know this was quite the epic tale, so I appreciate you hanging in! When you’re out on the trail for 32 hours, a lot happens, and if I don’t get it out now, it will certainly fade from my brain. However, I can look down at the buckle on my desk and be reminded of my amazing adventure in Virginia, #chasing42!